Cadet Flight Sergeant Phoebe Jenner was recently able to put some of the first aid training she has undertaken at 84 (Coventry Airport) Squadron into practice when she offered advice and assistance to a family whose son had collapsed in the street. 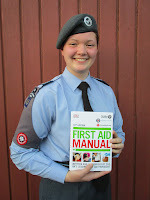 During her time with the Royal Air Force Air Cadets, Flight Sergeant Phoebe Jenner, aged 17, has been part of the squadron since 2012 and as part of her training she has undertaken two first aid courses. Starting with the British Heart Foundation Heartstart programme which is a basic short course teaching cadets how to deal with basic unconscious and non-breathing casualties. Following this she then took the weekend-long Youth First Aid course which is a St John Ambulance qualification. This goes into much more detail about a wide range of potential scenarios one of which appeared to have happened right in front of Cadet Jenner. "I was coming out of a friend's house when we saw a group of people surrounding someone lying the in the road, so I ran over to see if I could help. A 16 year old lad had collapsed in the road, and was having an epileptic fit. We made sure that he was in the recovery position, covered him with a blanket, and put pillows under his head. It seemed he had controlled how he fell so didn't have any injuries. He was unconscious but was breathing and occasionally slightly responsive. Someone else had called an ambulance so I stayed with them until it arrived. It's good that the training I have had gave me the knowledge that could help him, and I think it is a really valuable part of our learning at cadets." Well done Cadet Flight Sergeant Jenner.